Begin seated on the floor. Bend your knees and hold on to the backs of your thighs. Lean back and balance on the back of your sitting bones—but not so far that you roll onto your tailbone. One at a time, lift your feet off of the floor so that your shins are parallel with the floor. Keep your legs together. Pull back against your thighs, and rotate them inwardly to help maintain the natural curve in your lower back. 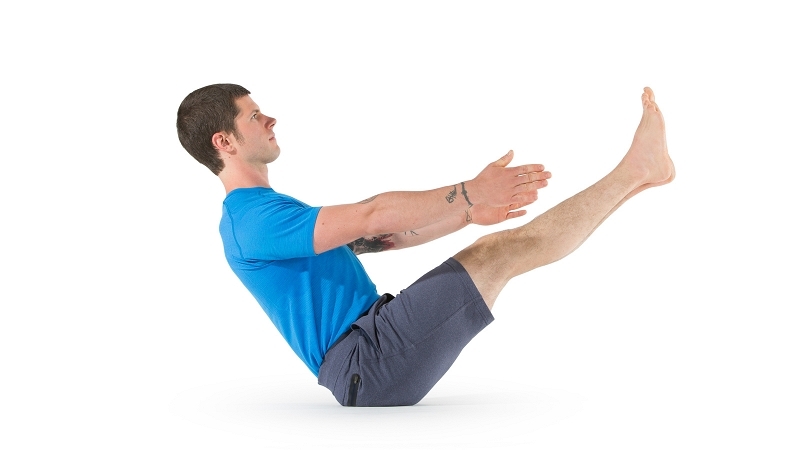 Lengthen your spine and broaden and lift your chest. If you can maintain that length and openness, begin to extend your legs toward straight. Extend your arms so that they're parallel with the floor. Back off the pose if your lower back starts to collapse (round)—hold onto your thighs, bend your knees, or even place your feet back on the floor. Make a big loop with a strap. Wrap one end of the loop around your upper back right behind your shoulder blades. Wrap the other end behind the soles of your feet. Start with your knees bent, and then straighten your legs if and when you feel stable. You may need to adjust the strap so that it's taut enough to support you. The support of the strap allows you to stay in the pose longer and to focus on lengthening through your spine. It can be especially helpful if you tend to clench or “grip” your hip flexors or round your lower back.